MicroQuilter color card is a card wound with actual thread to be used as a reference. Includes all 30 colors. 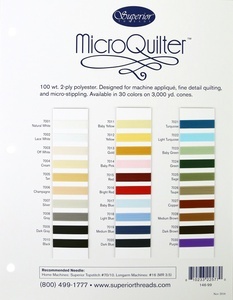 MicroQuilter is a 100 wt./2-ply extra-fine polyester thread designed for invisible machine applique and detail quilting. It is an extremely fine thread that can be sewn with a very small needle renders the thread virtually invisible. The preferred thread for micro stippling and miniatures; available in 3,000 yd. cones (only).